Important: We consider a coordinate system with X axis being positive on the left of the origin and Y axis being positive to the bottom of the origin, like for a screen with top-left pixel with (0,0) coordinate. This is important because sometimes I use term such as "left", "top" or "clockwise". If you intend to use another coordinate system, make sure to take care of that. See the constructor for each type of interpolation for more details. Each interpolations are implemented by a class and a set of CLOS methods. This way, it is easy to implement new interpolation scheme inside the library. Paths of types :closed-polyline and :polygon are always closed implicitly by a straight line (or a custom interpolation) from the last knot to the first knot. Compute the translation of point-1 by point-2. Compute the translation of point-1 by the opposite of point-2. This is equivalent to (p+ point-1 (p* point-2 -1)). Scale point by scale along the X axis, and scale-y along the Y axis. If scale-y is unspecified, then the point is scaled by the same amount in both axis. Rotate point around origin by angle radian. Compute the angle between the ray from the origin along the X axis and the ray from origin by the given point. Compute the distance of point from the origin. Compute the distance from point-1 to point-2. This is equivalent to (point-norm (p- point-2 point-1)). type -- a symbol, among :open-polyline, :closed-polyline or :polygon. Create a new empty path of the specified type. To describe a path, the first knot is usually specified with path-reset, then the rest is specified by a serie of call to path-extend. Remove all the knots from the path. Reset the path such that it starts at position given by knot. All other informations (except the type) are discarded. The implicit interpolation between the last knot and the first knot will be a straight line (which matter only if the type of the path is not :open-polyline). Extend the path from the last recorded knot to join the specified knot. 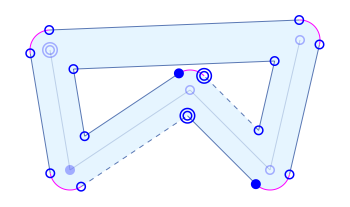 The interpolation argument specify how both knots are joined. If the path is still empty, then the interpolation argument specify the implicit interpolation between the last knot and the first knot if the path is of type :closed-polyline or :polygon. Concatenate other-path to path. The other-path is kept unchanged. If interpolation is not null, it will be used as the interpolation to join both path. Otherwise, the first interpolation of other-path is used. Replace path such that it is identical to other-path. The other-path is kept unchanged. type -- Either :open-polyline, :closed-polyline or :polygon. Give the type of path. Give the number of knots of path. Give the last knot in path. If the path is empty, NIL is returned. Return a path which is identical to path. Reverse the path in-place. See PATH-REVERSED to create a new path instead. Translate in place the path by the given vector. Rotate in place the path, either around origin (if center is NIL) or around center, by angle radian. Scale in place the path by scale-x along the X axis and by scale-y along the Y axis. If center is not null, the path is scaled relatively to center. Interpolations describe how knots are connected along a path. An interpolation only specify the information needed in addition to the knots already on the path. 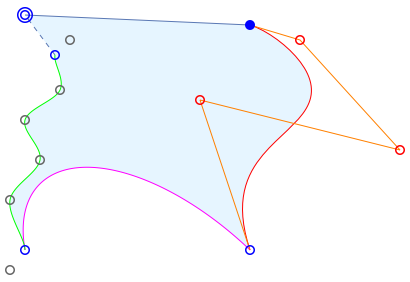 For example, for a bezier curve of degree 2, only a single control point is necessary since the library will use the two knots around the interpolation to render it. 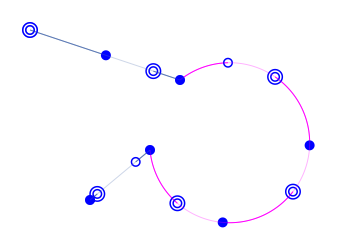 a Catmull-Rom spline (in green) with a total of 8 control points (blue + grey circles, outside and on the path). Describe a straight line between the knots. 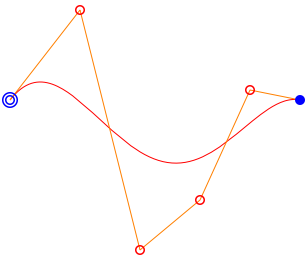 This describe an arc using SVG convention. Please see documentation on w3.org for more details. where knot1 and knot2 are the knots on the path. 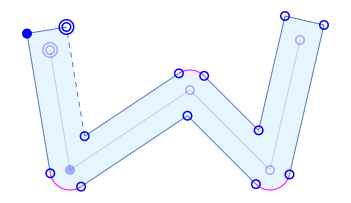 A short explanation of this type of splines is available here. This describe a Bezier curve interpolation. The degree of the curve depends on the number of control points passed as arguments. 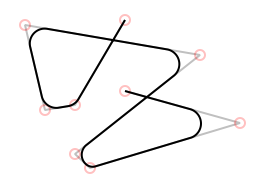 Since the knots around the interpolation are part of the Bezier curve, the degree of the curve is the length of the controls points list minus one. Create a new interpolation object with the same information as the original. Change the interpolation such that it is reversed. It is used when reversing a whole path. In such case, each interpolations are reversed in the process, and this method must take care of it. When the end of the path is reached, the iterator loop at the beginning. A marker is available to detect end of path. When an iterator takes another iterator (instead of a path), it will be called a filter in this documentation. Reset the iterator such that its state is like when it was first created. Move the iterator to the next point, and returns information where the iterator is located. The interpolation is the one between the previous knot and the returned knot. If the knot was the last on the path, then end-p is true. If the path is empty, then end-p is true and both interpolation and knot are NIL. Create a new iterator over the given path. Create a new iterator, which automatically segment (convert interpolation to discrete path) for any interpolations which is not matched by the predicate. The predicate must take one argument, which is the interpolation, and return a boolean value, which is true if the interpolation must be converted to a serie of straight line. This iterator is used at various place internally to process a path, transforming interpolations not handled by some transformations. Create a new iterator which discard any knot which is not distinct from the previous one. Since iterators are cyclics, a problem may arise if both ends of the path are not distinct. If preserve-cyclic-end-p is true, then each ends will be returned by the iterator. Otherwise, only the first of the these knots will be returned and the last knot will be the knot before the last which is distinct. Function to generate basic path shape are provided. 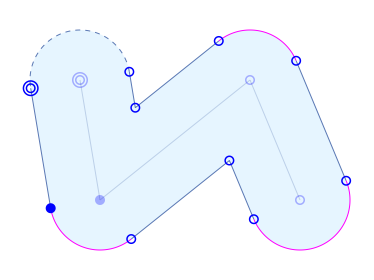 Create a new path describing a circle (or ellipse) centered at (cx,cy). Since SVG arc cannot describe an entire circle, such a path is made of 2 half-circles. Create a new path describing a rectangle between (x1,y1) and (x2,y2), whose sides are parallel to axis. If round is specified, then each corner are rounded to the radius specified by this argument. The argument round-x and round-y allows to specify different radius for each axis. Some transformations can produce more than one path. So, it was decided that by default most transformation return a list of path (possibly none, or usually only one.) And they can take either a single path or a list of path as parameter. 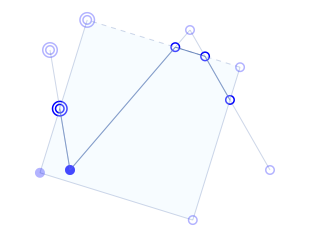 Produce a new path only composed of straight lines, effectively transforming all interpolations to a serie of segments. Several special variables can be modified to change the precision of the segmentation. 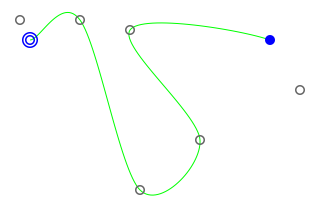 Bezier curves are adaptively refined until meeting certain criterions, such as flatness or small angular step. 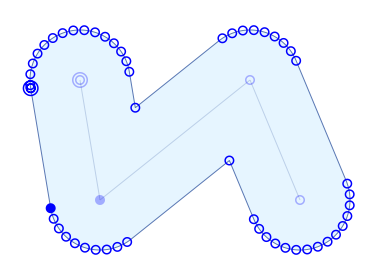 Catmull-Rom splines are currently not rendered with adaptive method, but this is planned. Default is 0.5. 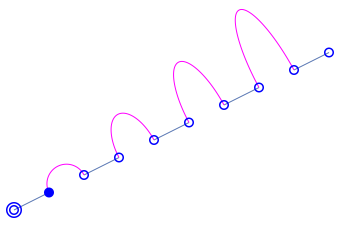 For Bezier curves, this variable give the maximum distance allowed between the middle point of the curve and the straight line from both ends of the curve, at each refinement. Default is 0.05 radian. 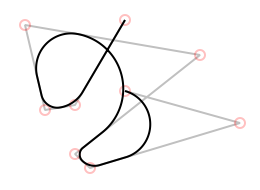 For Bezier curves, this variable give the maximum angle in radian allowed between the line from the first point and the middle point and the line from the last point and the middle point, at each refinement. Default is 1.0. Not used yet. This variable specify the maximum allowed length of segment used to describe an arc. It is described by straight lines and arcs. assume-type -- NIL or a path type. Returns a stroked path. The resulting paths will depend on the type of the input path. If it is a polygon, the result is the contour of it (assuming the polygon was described clockwise.) The assume-type argument allows to override the type of the path while deciding how to stroke it. cycle-index -- a non-negative integer, smaller than the length of the sizes array. Produce a dashed path. FIXME. The value cycle-index specify where to loop in the sizes array once the end is reached. Not included in the current release yet. Round each part of a path up to the given radius. This is done only between consecutive straight line, while the rest of the path is kept inchanged. 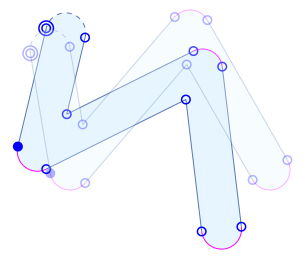 Note that it is not related to Bezier curves. The resulting path is composed only of straight line and arcs. 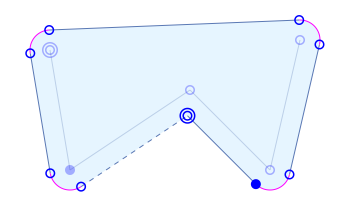 In this example, an open polyline is clipped against a rotated rectangle.